STRIKING junior doctors and radiographers face disciplinary action after they ignored a court ruling that their job action was unlawful and were given a 12-hour ultimatum to report for duty, the Health Services Board (HSB) said yesterday. 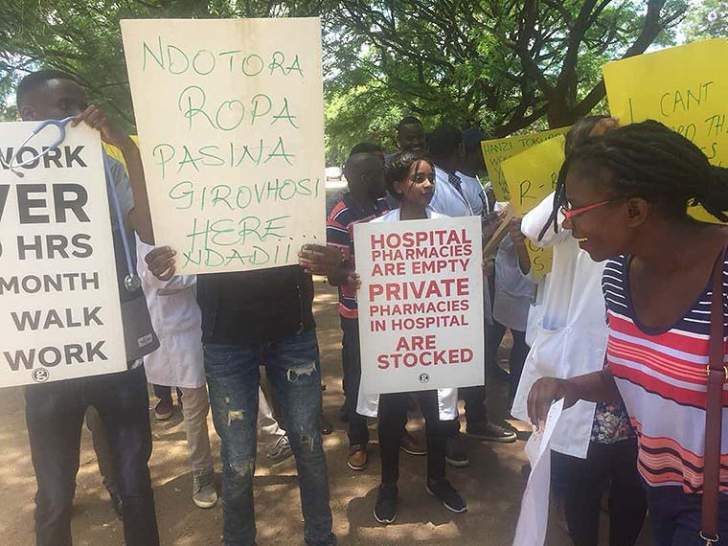 However, the doctors have accused the HSB of acting in bad faith for taking the issue to the Labour Court in the middle of negotiations after Cabinet last week assigned Vice President Constantino Chiwenga to oversee the process. At least 553 doctors and radiographers are on strike and the order for them to return to work expired at 9 am yesterday. The new twist to the health workers' industrial action comes after a Labour Court on Saturday night ordered doctors to return to work within 12 hours saying the 23-day strike was illegal. Labour Court judge Ms Betty Chidziva ruled in favour of the HSB, which hires doctors. In her ruling, she noted that doctors offer what is classified as an "essential service" and therefore cannot engage in collective job action. Addressing journalists in Harare yesterday, HSB vice-chairperson Professor Auxilia Chideme-Munodawafa said all the striking health workers had chosen to ignore the court order. This, she said, had led the HSB to institute disciplinary action against them. "Most or all of the health workers who had withdrawn their labour have not reported for work in the timeframe stipulated in the disposal order made by the Labour Court," she said. "Government is accordingly proceeding to institute disciplinary action against all health workers who participated in the unlawful collective job action," she said. Doctors working in public health institutions went on strike at the beginning of the month citing low remuneration, lack of drugs at hospitals and poor working conditions. Radiographers joined the strike six days later without formal 14-day notice to Government as stipulated by the law. In Press statement yesterday, the Zimbabwe Hospital Doctors Association (ZHDA) accused the HSB of acting in bad faith after they were given an impression by the Ministry of Health and Child Care that negotiations were being finalised, but the latter chose to drag the ZHDA to the Labour Court. The association said it had hoped, following a Cabinet decision on Wednesday, that Vice President Dr Constantino Chiwenga would now provide oversight in the negotiations, the strike action should have ended by yesterday. The "HSB has negated and reversed all the progress thus made to terminate the industrial action," read the ZHDA statement. "To the best of our knowledge, a communication was made to Vice President Dr CGDN Chiwenga regarding the grievances raised by doctors and hence we are still waiting in anticipation for the response before any further deliberations are conducted," it said. "To this effect, we are suspending all negotiations with HSB and Ministry of Health until such a time that an honest, comprehensive and satisfactory offer has been proffered through the Bipartite Negotiation Panel (BNP)." The association said it blamed the HSB for failing to manage the industrial action that entered its 23rd day yesterday. After a nationwide consultation with its members, the association said doctors agreed not to return to work until their grievances have been addressed. "It is indeed shocking that in this day and age, HSB expects doctors to report for duty without a salary and further wishes to conduct disciplinary proceedings on all members who engaged in the industrial action," said ZHDA. Further, the association said it was difficult to comprehend how the negotiation platform had been abandoned with the board spending more time in the court than addressing the grievances raised by doctors. The doctors said even if they were to return to work, they doubted that they could discharge their duty to patients optimally in a poor working environment and without their salaries. They also accused some officials at HSB of politicising the industrial action to gain favours with those in authority instead of resolving their grievances.